There’s no sweeter accomplishment than the one that comes from consistent effort and concentration on realizing a particular goal. Then when one looks to the right, left and back to see others collaborating with you, one knows the mission will be accomplished. Albert Vann and Annette Robinson are examples of such mission-driven effort. They and a cadre of community residents held fast to politically, economically and academically empowering the people of Central Brooklyn through the establishment of the Vanguard Independent Democratic Association (VIDA) in 1973. Albert Vann and many more people can look back on 45 years and wonder how did 45 years elapse so quickly. They also consider what more needs to be done. The celebration at Giando’s on the Water in Williamsburg makes the case that VIDA is on task and has experienced victories due to collaboration, planning and plan execution. There are still many people who need to be politicized, educated and enjoying a better standard of living for their households. The night of October 11, 2018 at Giando’s on the Water was one filled with recognizing people in different fields of endeavor starting with the cadre of people who made up VIDA’s board and moving on to congratulating professionals in their given fields for making positive impacts in labor, health, education, transit and the unions to name a few. VIDA counts 37 people as founders and 19 people as pioneers who are alive and acknowledge the 16 founding members and 12 pioneers who have since passed away. VIDA’s current executive leadership and board includes Hon. Al Vann, Founder; Hon. Annette M. Robinson, Vice Chair, Kings County Democratic Party and Female District Leader; Hon. 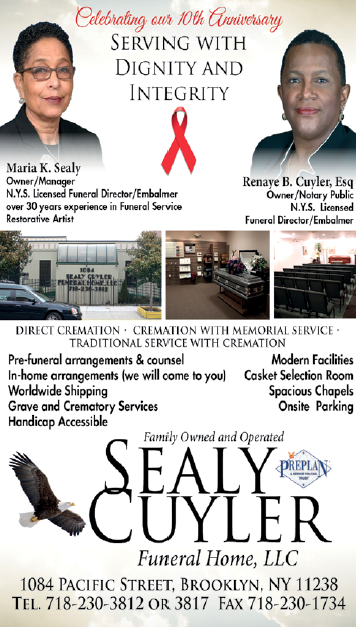 Robert E. Cornegy, Jr., CD 36; Henry L. Butler, President; Hon. Tremaine S. Wright, NYS Assembly, 56th District; Stefani L. Zinerman, Membership Vice President; Babatunde Akowe, Political & Social Action Vice President; Tyrone Woods, Counsel of Elders Vice President; Chinyelu Udoh, Vice President and General Counsel; and C. Doris Pinn, Treasurer. Many contend the importance of keeping labor unions in existence. Working in unionized fields have moved many households from poverty to middle class. 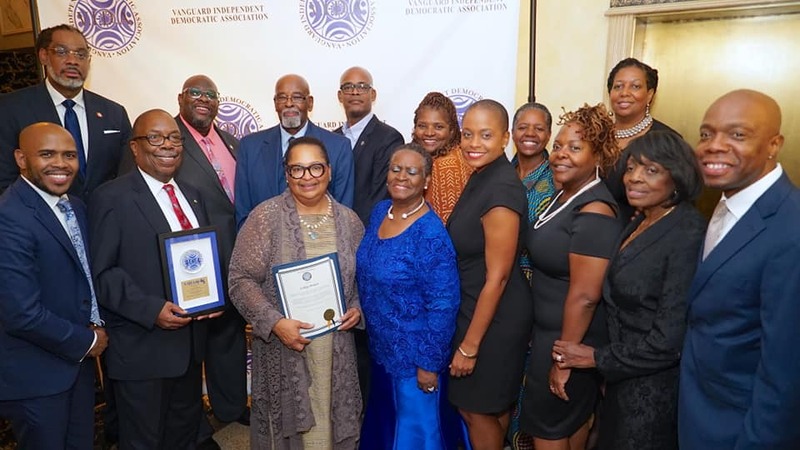 The Vanguard Spirit Awards for 2018 were bestowed upon the following labor professionals: Wanda Williams, Political Action & Legislation for District Council 37; Shaun D. Francois, President of Local 372, District Council 37; Michelle Akyempong, Vice President, Legislative & Political Action, Social Service Employees Union Local 371; Earl Phillips, Secretary Treasurer, Local 100, Transportation Workers Union; Dell Smitherman, Downstate Political Director, SEIU Local 1199; Elizabeth Perez, Brooklyn Borough Representative, United Federation of Teachers; and Herman Merritt, Assistant Director, Governmental Affairs, Council of Administrators. Community Partner Awards were given to Laray Brown, CEO and President of Interfaith Medical Center and Noah Katz, co-President of PSK Supermarkets – Foodtown. Mr. Katz said, “It is an honor to be here. It is an honor to serve Central Brooklyn.” Katz gave kudos to the employees of their stores. With all the tables and chairs in use, it is accurate to estimate approximately 400 people enjoyed VIDA’s 45th year of community and political activism in grand style. The invited were donned in African print, kente cloth and the latest cuts in gowns and men’s suits. Giando’s on the Water is known for its ceiling-to-floor-length glass windows where diners can effortlessly enjoy views of the Brooklyn Bridge, Manhattan Bridge and Williamsburg Bridge as well as the Manhattan skyline. Besides the business, civic, governmental, academic and political accomplishments acknowledged that night, longtime marital and social relations were evident. There were tables filled by three generations of a family. Albert Vann had one such table. It is worth noting that so many business, marital and civic relationships have withstood the test of time. In her introduction of Al Vann to the podium Annette Robinson said, “They are working so hard to suppress our vote. Here now to bring focus to the man of the hour, it is indeed an honor to introduce Albert Vann. Al Vann is a man of deep thought, a man of courage and stands up for his people. Mr. Vann’s speech consisted of describing the conditions of Central Brooklyn, with attention to Bedford-Stuyvesant, before and after social and political activation by the Vanguard Independent Democratic Association. Vann has had a concern for the quality of education provided in the community as well as enervating residents to take ownership of Central Brooklyn, regardless of documented title to a particular block and lot. He has striven to build a strong and lasting “Black political base.” In his retirement, he stays active by heading the Boys and Girls High School Advisory Board. He is aware that more needs to be done to galvanize and sustain the community, therefore, he continues to work and enlist others to take on the responsibility.